Brian Lewis filed claim saying Jubilee sank "due to unknown causes"
(CNN) -- A Seattle man has been charged with insurance fraud for allegedly sinking his own yacht because of "financial pressure and frustration with the maintenance" of the vessel, authorities said. The Jubilee sank in Puget Sound Bay last year. On March 22, 2008, Brian Lewis, 50, scuttled the Jubilee in the Puget Sound Bay, then rowed a borrowed dinghy back to shore, according to court documents filed in February by prosecutors in King County, Washington. Later that day, Lewis boarded a flight to take him to his job in Kodiak, Alaska, as a petty officer with the National Oceanic and Atmospheric Administration, according to court documents. Three days later, Lewis filed an insurance claim with USAA Insurance reporting the Jubilee sank accidentally "due to unknown causes." However, due to environmental concerns, the Washington State Department of Natural Resources salvaged the vessel at a cost to the state of $2,866. An inspection found a hole was drilled into the bottom of the Jubilee, and that two main engine sea strainers appeared to have been broken with a hammer. "The vessel appeared to have been deliberately sunk," authorities said in their probable cause affidavit. Confronted by investigators, Lewis admitted he intentionally sank his vessel, saying the financial strain "caused him extreme anxiety and frustration." Lewis told investigators "the engine trouble he experienced caused him to lose his temper. In his rage, he smashed the sea strainers with a hammer and drilled the hole to sink the vessel," the affidavit said. "[He] wanted to clarify that his motive for sinking the vessel was anger and frustration, not greed," it added. 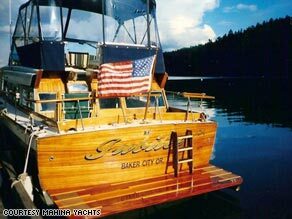 Prior to its sinking, the Jubilee had been listed for sale with Mahina Yachts for $28,500. The King County Prosecutor's Office has charged Lewis with making a fraudulent insurance claim. Lewis filed for Chapter 7 bankruptcy in 2004. Messages left for him were not returned.